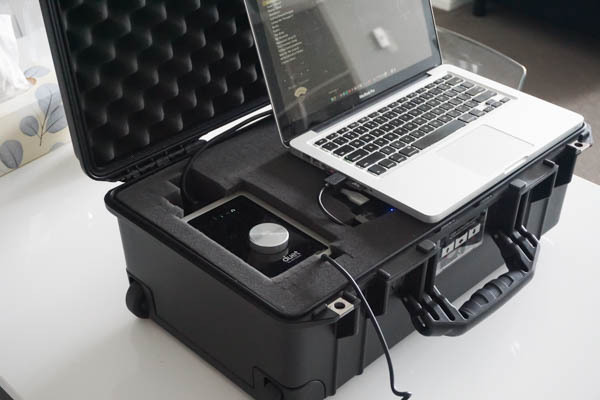 I built this portable music recording studio while in Australia and it allows me to easily perform and record with my computer and duet, while running mainstage or logic. The most difficult thing about performing with a computer is you have nowhere to put it on stage. You’re worried it’s going to get tripped or stepped on. 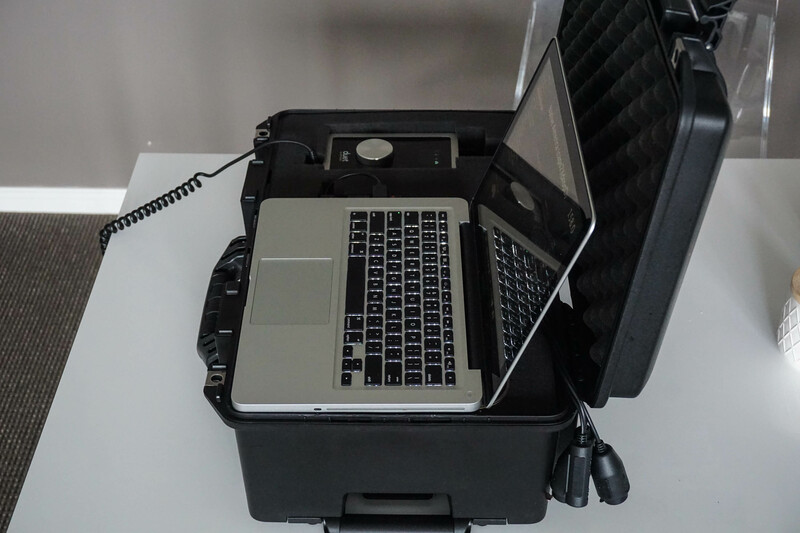 That’s why I researched pelican cases and imagined a way it could work. With the case I’ve built, I just open the lid, plug in one USB connection and open my software to perform. It’s very sturdy and all the connections are hard wired to the foam so your computer feels very safe and confined. 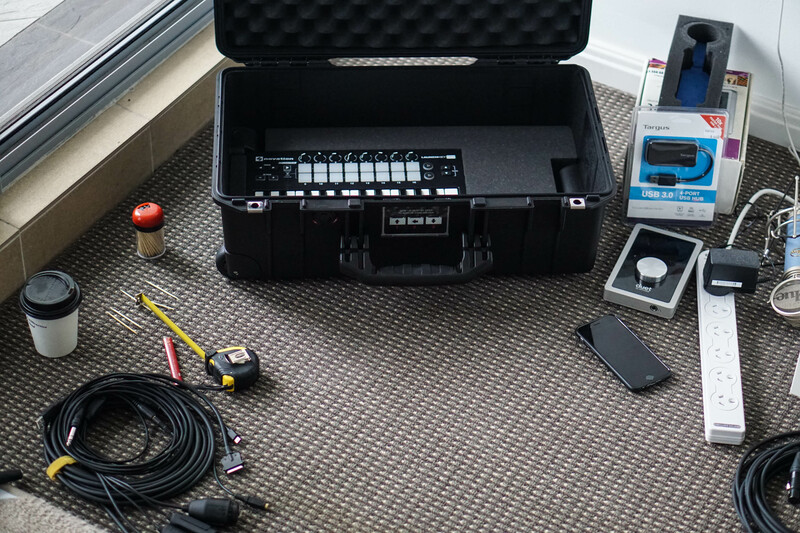 Since I had all the music equipment already, that’s basically all I needed except for audio connection adapters etc. I ran to the electronics store like 5 times buying little things. I used my AirBNB hosts’ serrated kitchen knife to cut the bottom foam. It worked really well and the keyboard fits nice and snug. Just make sure you cut slow if you want straight lines. To do the pull and pluck foam I used toothpicks to mark around the edges of my hardware pieces. Then I’d go back and assess to make sure I’m clear on where I want things to line up. Once you put your fingers in the foam you’ll understand how the pull and pluck works, it’s very simple. I also learned that it’s best to take out in chunks in case you want a shallower depth of the cutout. I made my case into two levels with stuff set into foam on the bottom layer that is not pick and pluck, and the top layer which is pick and pluck. I did this by cutting a piece of cardboard the exact shape and size of the foam insert. So the top, removable layer, kind of has a floor, so the items don’t fall through on removal. This way I can fully utilize the space in the bottom of the case as well. You can’t see it in the pictures but my Bluebird mic is set into the foam underneath my computer as well. That’s where I’m laying microphones and other items. I used the box at a show in Newtown and it ran great. Might even be the first time I’ve actually gotten it all to work with in-ear monitors, and mainstage processing. 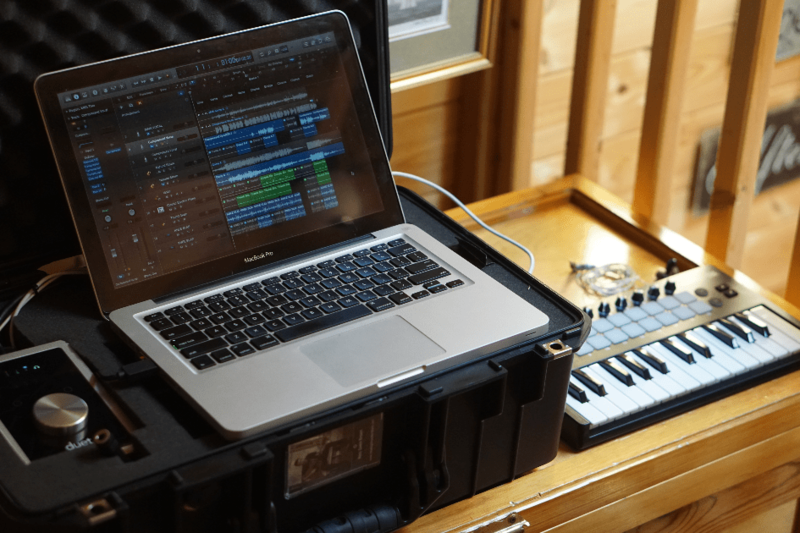 I’m now using the case at home as kind of a docking station to charge some peripherals and work on music. 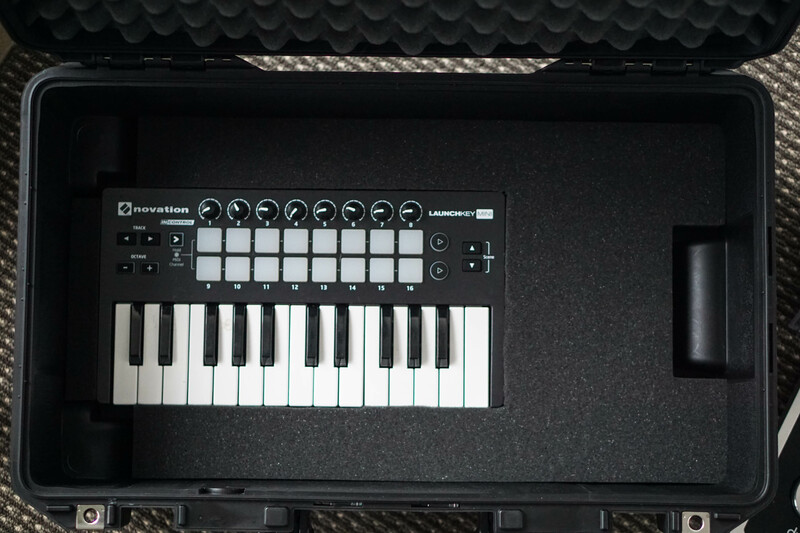 Instead of unpacking all my gear and setting it up on a table I just open a case and plug-in my mic. Update: I bought a Looptimus Pedal and I found a spot for it to slide in the back. A picture to follow. 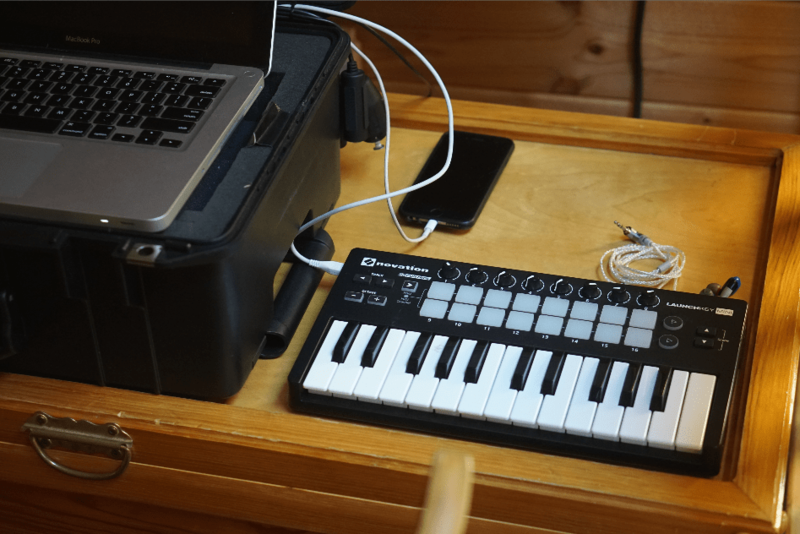 I also zip-tied together a wiring harness that has the input lines, an iphone charger, and mini usb for the keyboard. 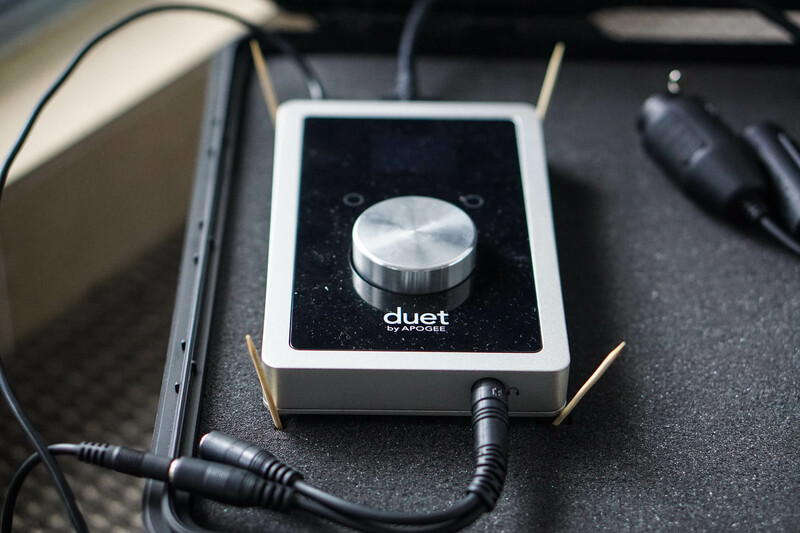 I’ve used it live a few times and I’ve been using it for mobile session work constantly. Everything is always plugged in and setup so at the drop of a hat you can be up there making music. I’m very pleased with what I came up with, let me know if you’re starting a similar project! e- mail me or comment if you want to chat!